A new patch is being released. It includes the end of ranked season 3, and an Arsonist buff, namely the Arsonist will no longer die to bodyguards or traps when attempting to douse someone. Your forgetting about ranked practice- Arsonist is super underpowered, and still will be with this buff. Ever since the coven expansion update when the RP/Ranked rolelist was changed, NK got nerfed greatly. 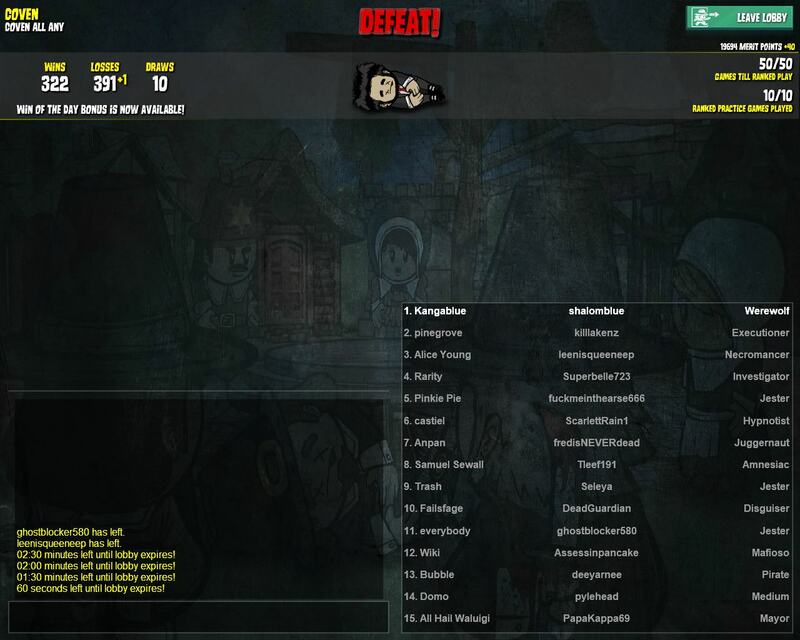 Mafia/Coven and Town win about equally, but NK almost never wins. I'm happy with this change- when you need almost everyone doused as Arso to win, and there's a mayor with a BG protecting them, your screwed unless Mafia/Coven can kill them off- if you ignite, even if you kill the BG, your bound to be voted up with the amount of people left at this point. Arsonist is definitely not overpowered, even in all any I wouldn't say so- the only mode I'd say Arsonist has a big advantage in is in Rainbow which barely anyone plays anymore; Other than that, Arso is ok in All Any, but horrible in RP/Ranked. Yaknow when I said earlier that NK never wins in Ranked Practice? Really proud of this game. I was Kangablue the Serial Killer..
Night 1: I killed plznotrashtown, who ended up being psychic, and Sejs the Investigator was killed by a Veteran, who was confirmed at this point to be William Phips. Both TI spaces are gone. Day 2: Despite that, Tea and Ravenor come out as psychic- great. I remember that Ravenor had MyFirstCovenGame, Kangablue (me), and Crusader on their evil list. I don't remember Tea's list exactly, but I know that Crusader was on it. Crusader claimed Trapper, and I just claimed TP. But, collectively, town agreed to lynch a psychic claim because if both were real, that would be two RT's gone already. Ravenor is lynched, and he turns out to actually be psychic- unlucky for him. Night 2: I decided to kill someone that wasn't on either of the psychic visions and wasn't talking at all. I killed SomePokemon, who ended up being Medium- great. MyFirstCovenGame was executed by the jailor, and luckily was Hex Master so I wasn't screwed from the psychic's vision- that was a relief. However, I was attacked- I'm guessing this was by the Potion Master. Day 3: This day, I immediately claim vested and attacked, and said that I was Bodyguard- normally, I wouldn't claim this as it looks super suspicious, but I had an excuse as I openly claimed TP the last day. I switched out the Crusader will I was making for a Bodyguard will, and said I guarded Tea Night 1 and Vested and Attacked Night 2. 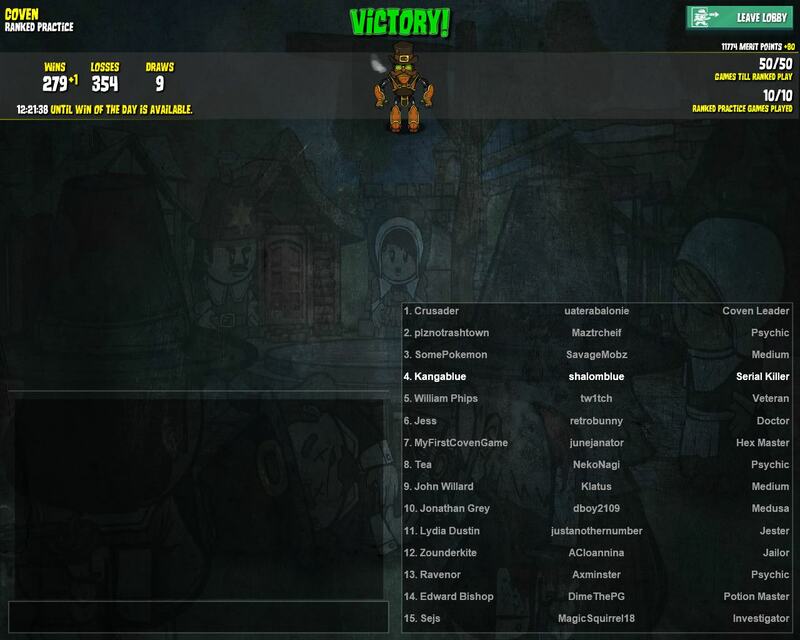 Crusader (the person) is the one lynched today. He claimed Trapper, and said he trapped and protected me, trap being broken by Potion Master- however, I combat that by saying I vested. I knew Crusader had to be lying as if a Trapper really did visit me, Potion Master would of died. Crusader is killed and ends up being Coven Leader. Around while the Coven Leader is being lynched, Jess the Doctor whispers me to make a Doc/BG combo, and I agree to it. Night 3: First, I put in my will that I was 'protecting' Jess. I then decided to kill Zounderkite due to how he's been leading the town without really claiming a role. Apparently Medusa, who now has the necronomicon, had the same thought though, and both of us end up attacking Zounderkite that night- waste of a kill unfortunately. I was right- Zounderkite was jailor, but I didn't know this at the time as he was stoned by Medusa. Day 4: Tea, the psychic claim, came out saying that either Edward Bishop, Jess, or William Phips. Willilam Phips is confirmed as veteran, leaving Edward Bishop and Jess. I defend Jess and push on Edward Bishop, who claims Doctor, an obvious evil claim at this point. Edward Bishop turns out to be Potion Master upon being lynched. Funny thing is that Edward Bishop also claims to have protected me Night 2, and I yet again argue I vested. At the same time, veteran communicates with me- I tell him about Jess and our "doc/bg combo." He seems to believe me. Jess also tells me that she was jailed the previous night- this confirms that Jess is not the Serial Killer to town. Night 4: I yet again say that I protected Jess- unfortunately, she was confirmed not SK, but I couldn't kill her as then I would be outed. I instead target Tea as I didn't want to kill the last coven just yet, and I was pretty sure he was Psychic at this point. Medusa also ends up targeting Tea, making it two nights in a row where we targeted the same person- great. Day 5: John Willard the Medium comes out instantly, saying that Zounderkite was the Jailor. Then a role call is done, and Lydia Dustin claims Sheriff- an extremely suspicious role to claim. Jonathan Grey had claimed Crusader earlier I believe, I don't exactly remember. Lydia Dustin is thrown onto the stand, and guiltied by Jess and me. Lydia Dustin turns out to be Jester. Nobody innocented, so the Jester has free choice of anyone to kill (remember jester can now haunt those who abstain). Night 5: I was in a pickle here. 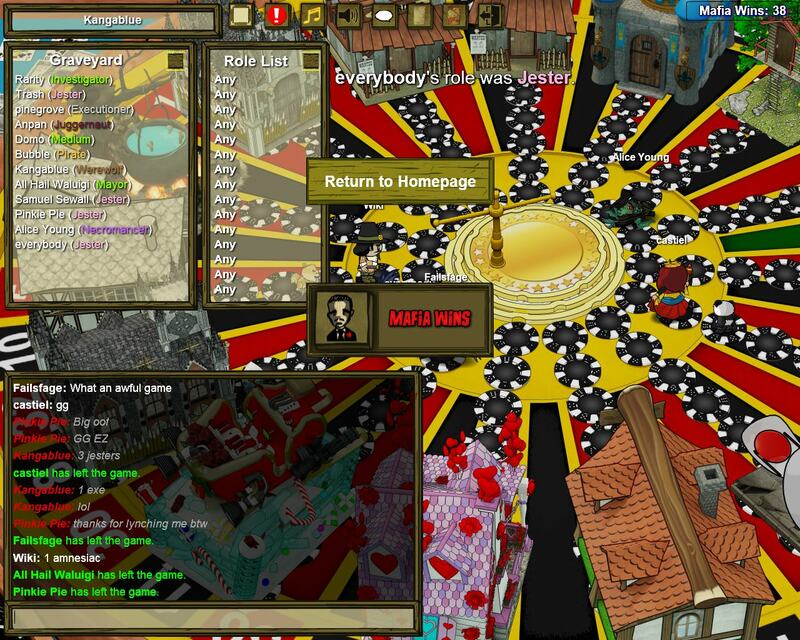 Really, I wanted to kill the Veteran as the confirmed town, but didn't want to take the risk. I was hoping Jester would kill Vet- I even said that in my death note. 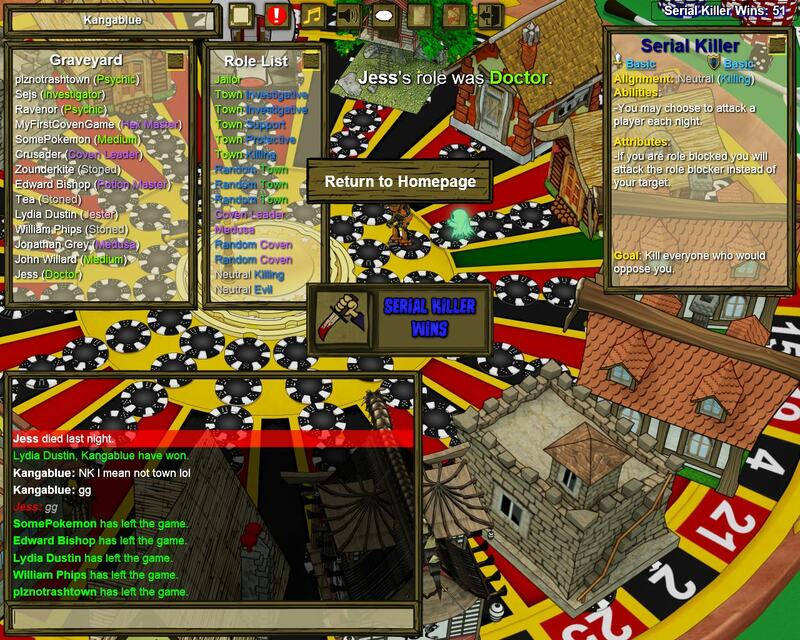 I decided to attack the Medium, John Willard, as the least likely person to be killed by Jester or Medusa. I still was hoping Jess would live, as in a 2v1, I was hoping to fool her into voting with me. Three people were dead the next day: John Willard, killed by me, who was Medium. William Phips, stoned by Medusa, who was the Veteran, and Jonathan Grey, killed by both Veteran and Jester. With just me and Jess alive, I win on Day 7, killing Jess Night 6. Have to thank them for not delaying the game to Day 8 by self healing when it was clearly already over. -I'm not sure why the Coven Leader didn't witch anyone? Nobody claimed witched that game. Crusader (the person) seemed to know what they were doing and was defiantly active, but nobody was witched- perhaps they targeted non visiting/jailed targets, I'm not sure. -The new Jester rule is nice- in fact, it makes those who guilty less likely to be haunted by the Jester- after all, the ones who guilty are the ones that help them. Even with the old Jester rule, I may have still won if the Jester haunted Jess. -Jess could of still been the Serial Killer. 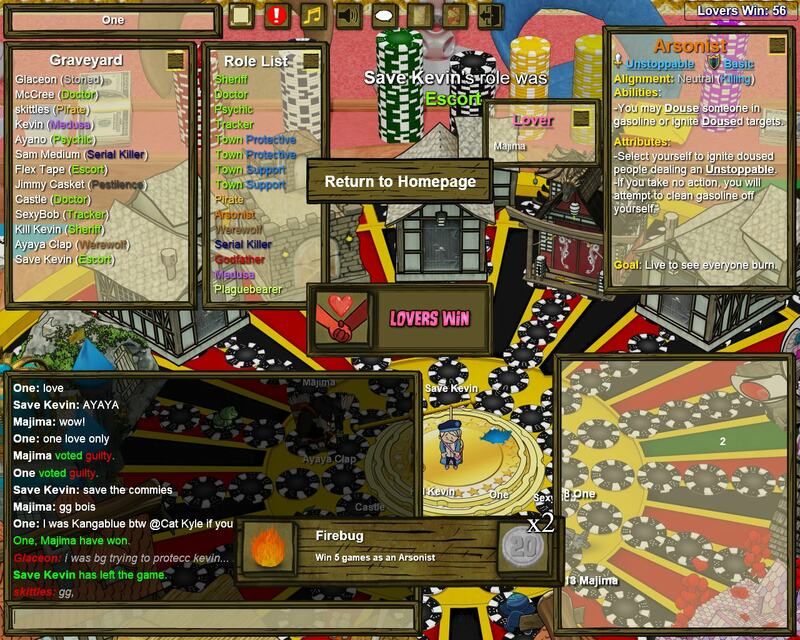 N3, Jess was in jail, and Jailor died to both Medusa AND SK. I didn't want to point this out because I figured Jess was the real TP and I didn't want her to die. If I was left with just the Vet and her, I was going to point that out. -Medusa killing Vet was a surprise, though I see why- after all I considered it as well. I personally as Medusa would of tried to find the SK not kill a confirmed town at that point. So yeah. I guess now I need Arsonist, Werewolf, and Juggernaut wins in Ranked Practice... Arso is still underpowered IMO. I was Investigator- I was witched onto medusa, saved by a trap, and died... its wierd how while Trapper can kill Coven Leader, trapper only stops their kill with the necronomicon- the witching still occurs which was why I died to Medusa. Kind of broken mechanic in my opinion. I mean, they didn't 'give' jester a win- nobody pointed out the fact it was obviously jester. I wanted a jester kill- turns out I didn't as medusa attacked vet but at the time I thought I needed it. And even if it was last coven it would be fine to kill them- as Jess trusted me and the real Jester would of then been lynched- as long as Jester killed Veteran actually it would of been fine still. By the way just look at this slaughtering. Why SK killed me when I claimed Poisoned, no clue. I was Vig- I was shooting the guy that claimed Poisoner Night 1 and was asking me 'who poisoned you?' day 2 over and over again. However, the freaking trapper trapped him.... still salty about that, he was actually freaking Poisoner and ended up gamethrowing later on.... so yeah. 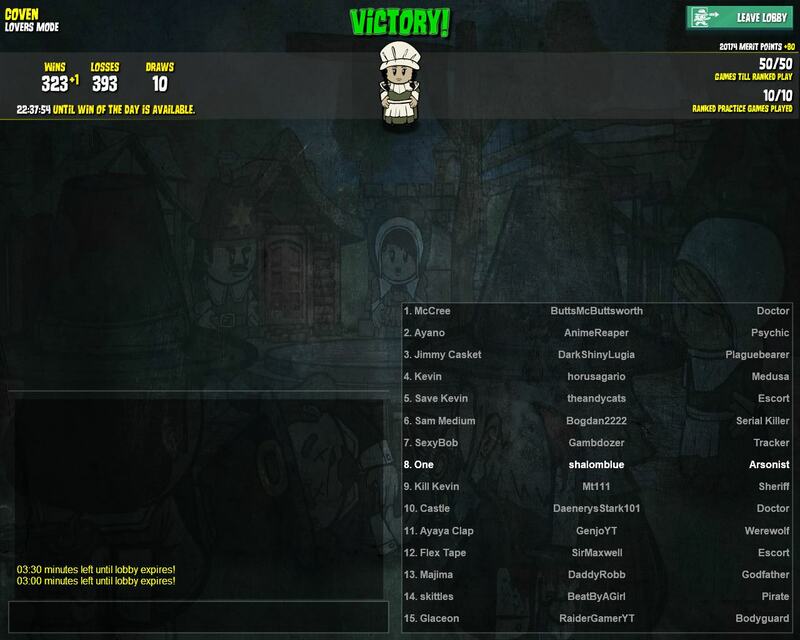 Town would of won if it wasn't for Trapper though... maybe. A lot of town was really dumb apparently- I stopped paying attention after a while. So this kind of logic is what you shouldn't do- I say its the Jugg and Pirates own faults for dying here. DON'T ATTACK PSYCHIC CLAIMS IN ALL ANY! They are likely evil. Just don't. Yay ToS in real life 3 is here.